Vigor testing does not only measure the percentage of viable seed in a sample, it also reflects the ability of those seeds to produce normal seedlings under less than optimum or adverse growing conditions similar to those which may occur in the field. Seeds may be classified as viable in a germination test which provides optimum temperature, moisture and light conditions to the growing seedlings; however, they may not be capable of continuing growth and completing their life cycle under a wide range of field conditions. Generally, seeds start to lose vigor before they lose their ability to germinate; therefore vigor testing is an important practice in seed production programs. Testing for vigor becomes more important for carryover seeds, especially if seeds were stored under unknown conditions or under unfavorable storage conditions. Seed vigor testing is also used as indicator of the storage potential of a seed lot and in ranking various seed lots with different qualities. It has been established that the conditions of seed development, maturation, storage and aging influence seed vigor. Seeds developed under moisture stress, nutrient deficiency, extreme temperatures, etc. often result in light, shriveled seed or collectively called poor-vigor seed. Preharvest environment of high humidity and warm temperatures can also cause loss in seed viability and vigor. Seed mechanical damage, whether induced by harvesting or conditioning equipment, as well as improper storage conditions are among the factors that adversely affect seed vigor. In addition, genetic factors such as hard-seededness, resistance to diseases, and seed chemical composition influence the expression of seed vigor. The general strategy of determining seed vigor is to measure some aspects of seed deterioration or weaknesses, which is inversely proportional to seed vigor. Cold test, accelerated aging test, electric conductivity test, seedling vigor classification, and seedling growth rate are among the tests that are used to measure seed vigor. In addition, the tetrazolium (TZ test) can be used as a vigor test by classifying the pattern of stained seeds into high, medium and low quality. The AOSA Seed Vigor Testing Handbook is a good source of information on seed vigor testing. Below is a brief description for some of the most common seed vigor tests that are used for various crops including corn, soybean, field beans, peas, grasses, vegetable seeds, and other crops. The cold test simulates early spring field conditions by germinating the seeds in wet soils (»70% water holding capacity) and incubating them at 5-10°C/41-51°F for a specified period. At the end of the cold period, the test is transferred to a favorable temperature for germination (e.g., 25°C/77°F in case of sweet corn). 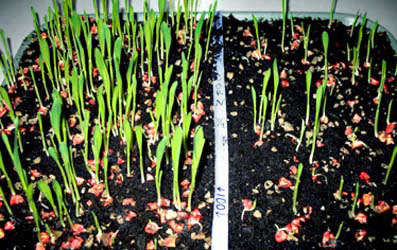 The percentage of normal seedlings is considered as an indication of seed vigor. Vigorous seeds germinate better under cold environments. When can the cold test be used? Select cultivars with the best ability to perform under cold wet soils for early spring planting. Provide basis for adjusting planting rates for individual seed lots. Evaluate the effects of adverse storage conditions, mechanical damage, drying injuries or other causes on seed germination in cold wet soils. The principle of this test is to stress seeds with high temperatures of (40-45°C/130-139°F) and near 100% relative humidity (RH) for varying lengths of time, depending on the kind of seeds, after which a germination test is made. High vigor seeds are expected to tolerate high temperatures and humidity and retain their capability to produce normal seedlings in the germination test. When can the AAT test be used? Can be used to determine the seed vigor of many crops. Useful in predicting the potential storability of a seed lot. This test measures the integrity of cell membranes, which is correlated with seed vigor. It is well established that this test is useful for garden beans and peas. It has been also reported that the conductivity test results are significantly correlated with field emergence for corn, and soybean. As seeds lose vigor, nutrients exude from their membranes, and so low quality seeds leak electrolytes such as amino acids, organic acids while high quality seeds contains their nutrients within well structured membranes. Therefore, seeds with higher conductivity measurement are indication of low quality seeds as vice versa. This vigor test is an expansion of the standard germination test (SGT). The normal seedlings obtained from the SGT results are further classified into ‘strong’ and ‘weak’ categories. 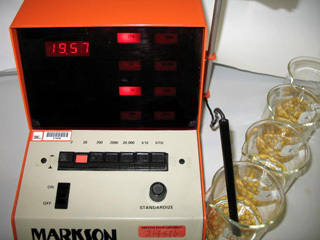 This test has been used for corn, garden beans, soybean, cotton, peanuts and other crops. Hypocotyl (the embryonic axis between cotyledons and root). Cotyledons (storage tissue of reserve food for seedling development). Epicotyl (the embryonic axis above the cotyledons). In this test, seedlings are classified as ‘strong’ if the above four areas are well developed and free from defects, which is indication of satisfactory performance over a wide range of field conditions. 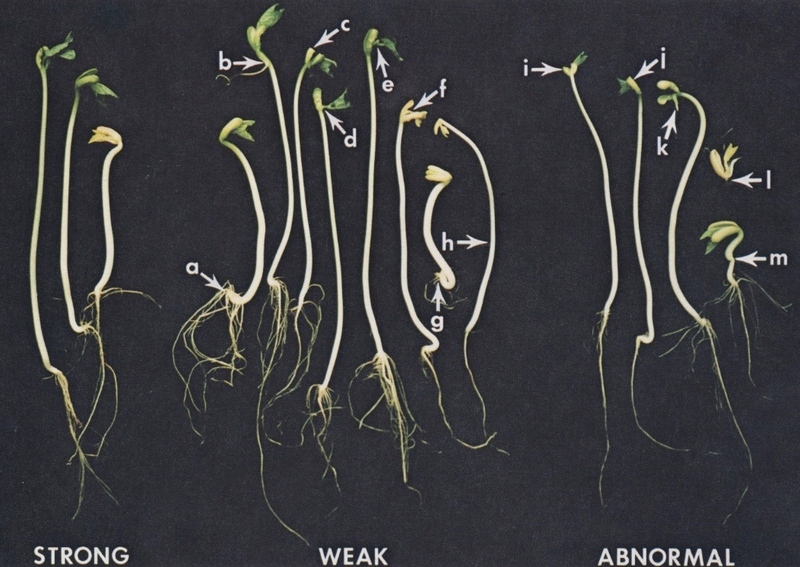 On the other hand, normal seedlings with some deficiencies such as missing part of the root, one cotyledon missing, hypocotyl with breaks, lesions, necrosis, twisting, or curling are classified as ‘weak’. AOSA. 2009. Seed Vigor Testing Handbook. Contribution No. 32 to the Handbook on Seed Testing. Elias, S. G., and L. O. Copeland. 1997. Evaluation of seed vigor tests for canola. Seed Technol. 19(1) 78-87. Kim, S. H., Z. R. Choe, J. H. Kang, L. O. Copeland, and S. G. Elias. 1994. Multiple seed vigor indices to predict field emergence and performance of barley. Seed Sci. &Technol., 22:59-68.